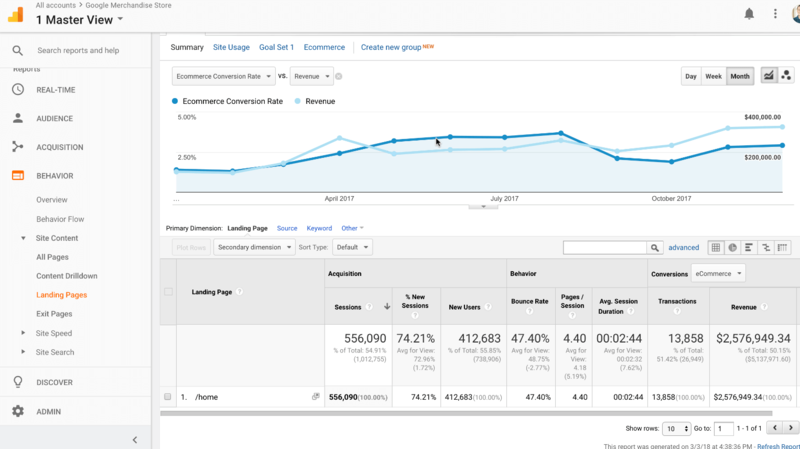 One the most impactful reports in Google Analytics is the landing page report. 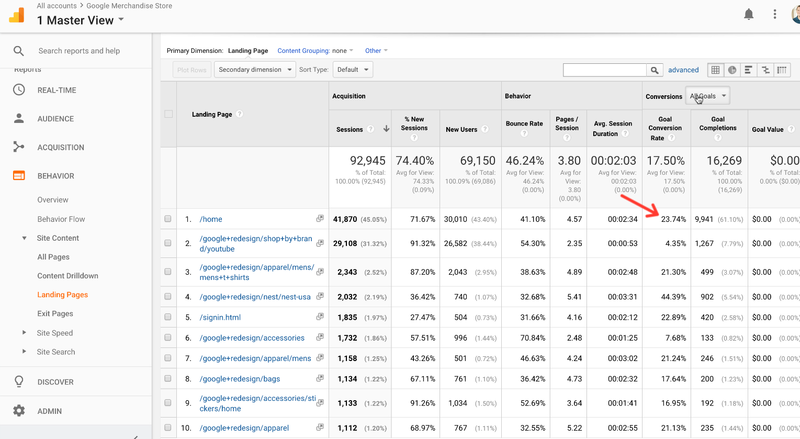 The landing page report is like a Google Analytics BFF for content marketers. It’s easy to use and instantly shows you how well each of your web pages is performing. Using the landing page report, you can find out which pages on your site earn the most traffic. And, you can see how well your pages convert visitors into leads or customers. Today, we’ll look at how to use the landing page report. Not only that, but we’ll learn how you can quickly make this report even better, by combining it with your Source/Medium data. And finally, we’ll look at how to set up the landing page report to tell us about the month over month performance of our web pages. Depending on your area of digital marketing, or who you talk to, the term landing page can have many definitions. If you are a PPC advertiser, a landing page is the destination URL of your ads. Email marketers use landing pages as tools collect email addresses. They create basic web pages that offer downloads, bonuses or discounts in return for an email address. A landing page may also indicate the place you send your email traffic, the destination of your email click-throughs. In web design, a landing page usually refers to a page that’s disconnected from your website. Typically these pages don’t have navigation, and they are used to capture email addresses or promote a product. So, most digital marketers think of a landing page as a webpage intended to get their visitors to perform one action – purchase, sign up or opt-in. But that’s not how Google Analytics defines landing pages. 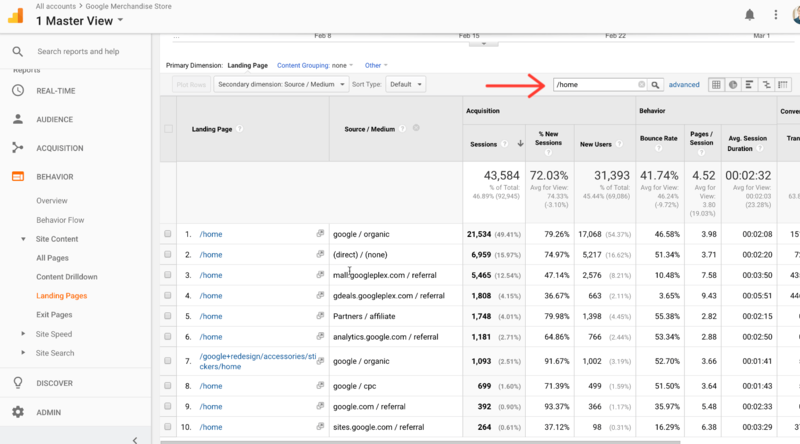 How does Google Analytics look at landing pages? To Google Analytics, a landing page is the first page viewed in a session. So, in your Google Analytics reports, a landing page is the entry point to your website. Studying the landing page report can tell us a lot about how visitors arrive on our websites. We can use this report to see how our pages generate traffic. And we can learn how visitors behave following the first interaction with our brand. Paul, one of our Analytics Course students, wants to know more about the conversion rate of his landing pages. I am trying to set up a report that shows goal conversion rate over time for each particular landing page. I can get the total conversion rate for the whole site or I can look at the static rate per page but can’t seem to find a way to display the conversion rate changing over time on a per landing page basis. Paul wants to see a historical comparison of the conversion rates for his webpages. There are potentially two landing page reports in your Google Analytics dashboard. You can find one of them under the Search Console reports, the other is in your Site Content reports. 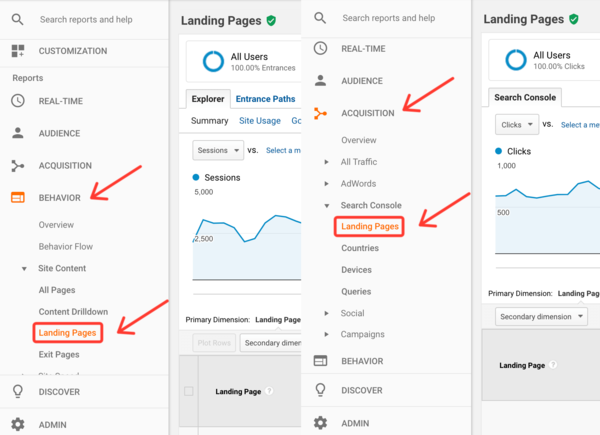 If you’ve connected your Google Analytics property to Google Search Console, then you also have two landing page reports. 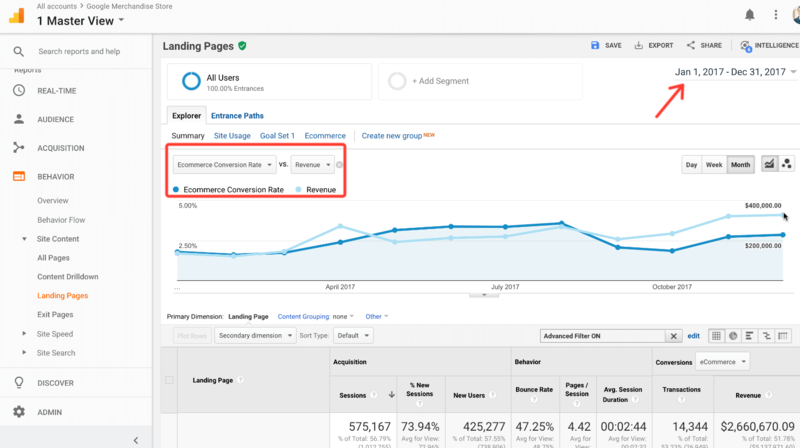 Your landing page report for Search Console lives under the Acquisition tab in your Google Analytics dashboard. This report is limited to landing page data from search results. 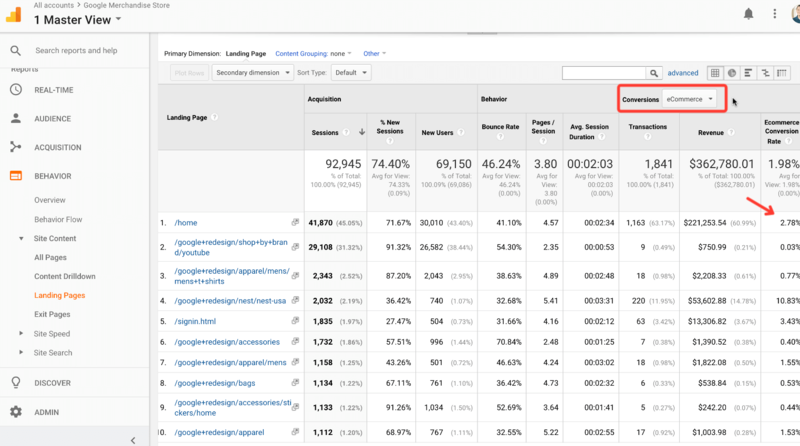 The landing page report in you Behavior tab shows page data from all traffic sources. 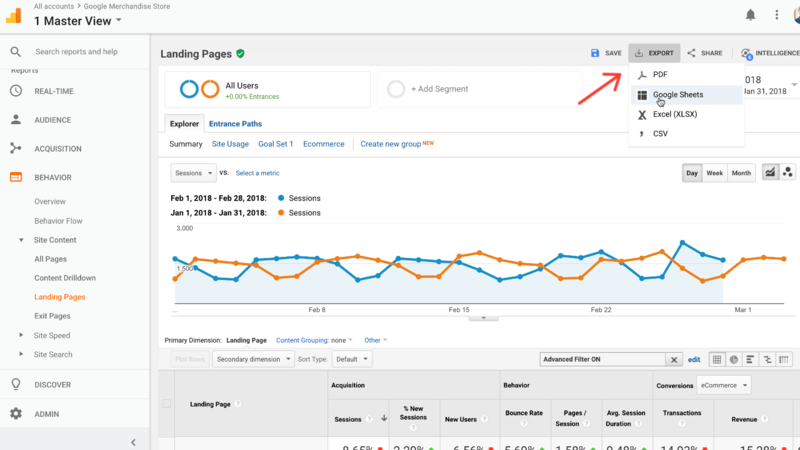 So, we when we refer to the landing page report in this post, we are talking about the report in the Site Content menu of your analytics dashboard. 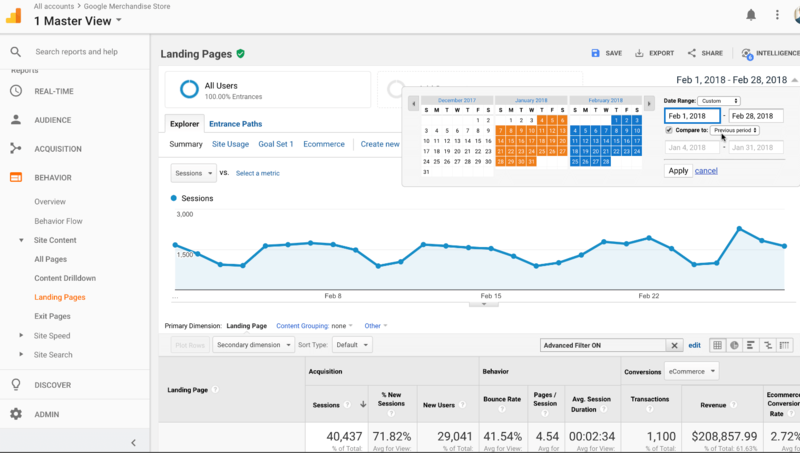 The landing page report shows all your all Google Analytics traffic and users metrics at a page-level. 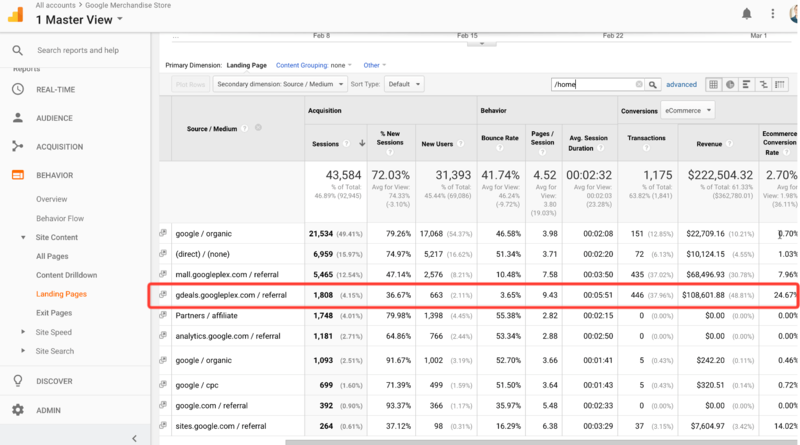 In addition to traffic data, you can also see conversion stats for each of your web pages. 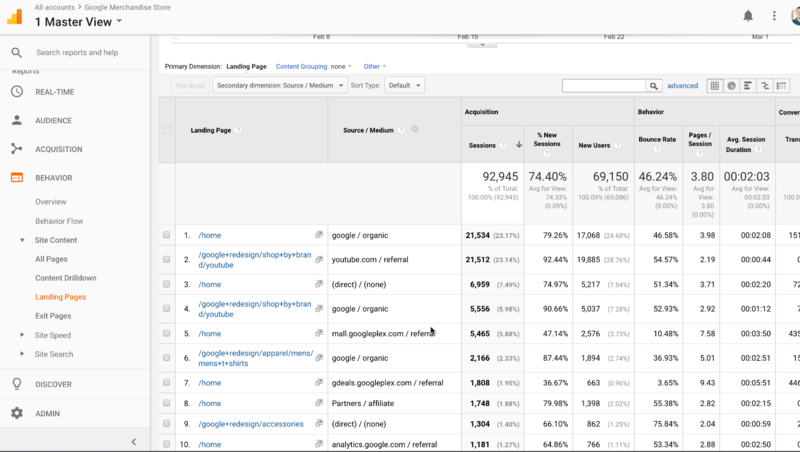 Let’s look at the landing page report inside of Google Analytics. For this tutorial, we’ll use the Google Analytics demo account. This account contains data from the Google Merchandise Store (GMS). Goals and e-commerce conversions are in the last three columns of the report. The Merchandise Store landing page report indicates that almost 24% of people that landed on the GMS homepage became a conversion. Those are some pretty motivated homepage visitors! If we filter conversions to only display e-commerce data, the conversion rate decreases quite a bit. But we can still see that the GMS is generating vast amounts of revenue from their home page. As an analyst, I always like to add context to my data. Before I start looking at month over month performance, I want to have a better idea of what’s driving traffic to my web pages. A great way to give context to your landing page report is to add the Source/Medium as a secondary dimension. The Source/Medium tells us how people are finding our landing pages. With the Source/Medium dimension added to our report, we can see the top traffic sources for the Merchandise Store. With our table filter in place, we can see that one source is driving the majority of the GMS homepage conversions. The referral gdeals.googleplex.com accounts for over 24% of the homepage conversions. Comparatively, the conversion rate for organic traffic on the home page is pretty low, just .70%. Using the Source/Medium in our landing page report can tell us a lot about the value of our traffic. In our GMS example, we see that almost all conversions come from referral traffic. And the referrals are coming from websites that are likely internal to Google’s network. Using the Source/Medium with our landing page report is a quick and simple way to add context to our traffic data. Now let’s use the landing page report to look at our conversion rates over time. The fastest way to create this report would be to use the Google Sheets Add-on in the Google Analytics API. During one of our previous tutorials, we learned that we don’t have access to the GMS data in the Google Analytics API– https://www.jeffalytics.com/google-analytics-api-custom-reports/. So we need to go back to the drawing board. So, instead, I’ll start by exporting this data and manually creating our report in a spreadsheet. To set up our report, I am going to include the top 25 landing pages. And I’ll compare the months of January and February. I’ll also add the e-commerce conversion rate to our metrics. Next, I’ll export my report to Google Sheets. Once the data is exported, I can set up a new tab in our spreadsheet. I’ll move the GMS homepage data from the content-landing-pages sheet over to a new tab (Sheet 1). Our new tab will focus on the homepage conversion rate. This process is a slow and cumbersome way to create this report. I only recommend this approach if you’re analytics masochist, or if you’re trying to create a very focused report. To add the months of November and December to the report, I need to export the data from Google Analytics a second time. 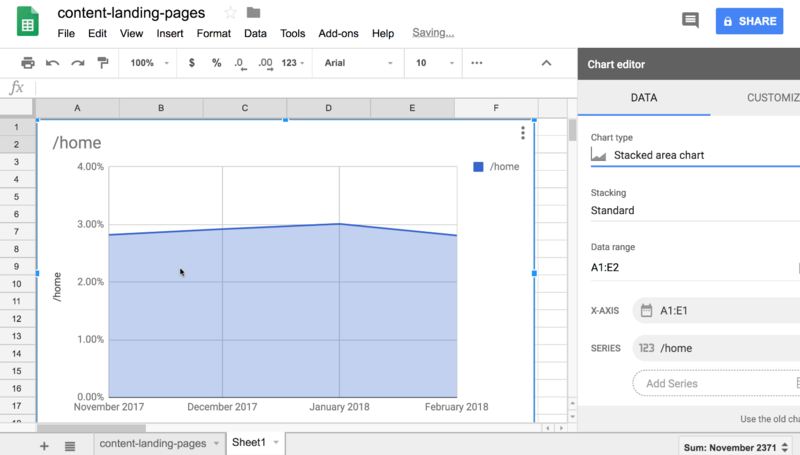 Once you have your page-level conversion rate data is in a tab, you can use the Google Sheets chart features to display trends. 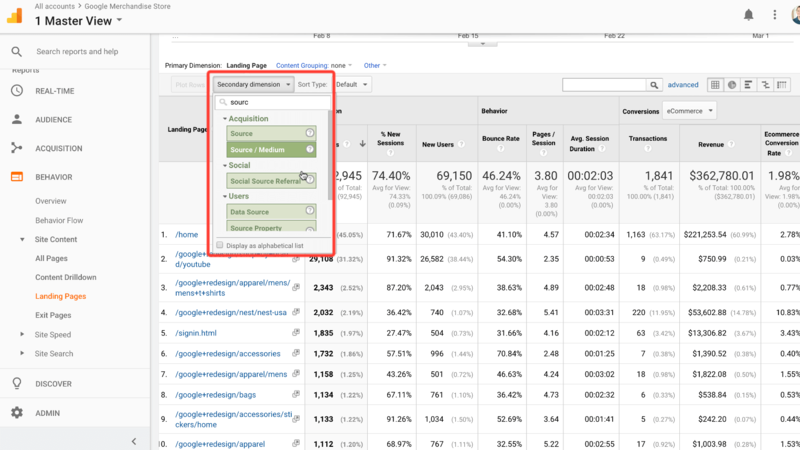 A quicker way to look at this data is right inside of Google Analytics. For this report, I’ll add in revenue as another indicator of page performance. Then, to look at our page-level data, I’ll select the home page. Now, we’ve created a conversion rate report, with historical data, focused on the home page. The downside to working on this report in the interface is it limits what we can do with our data. I could gain more flexibility over this data by exporting it to an external spreadsheet again. Building our page-level conversion rate report is a good example of the process web analysts work through to find the data they need. The first step is to see what’s available. The second step is to create the report you need manually. And the third step would be to automate the report. Conversion rates will vary across the board. Remember, averages don’t tell the whole story when you look at conversion rates. Averages represent the mean but not the median. Drill down as many levels as you can to find the real value in your data. Use secondary dimensions to qualify traffic. As we saw in the GMS example, page level conversion rates might not tell the whole story. Drill down further in your report to find your highest converting traffic sources. Use the Source/Medium to see what’s driving traffic to your landing pages. Export your data for long-term comparisons. Sometimes the Google Analytics comparisons tools can limit your flexibility. Use exports to gain more control over how you work with your data. Use the Google Analytics API to automate your reporting processes. 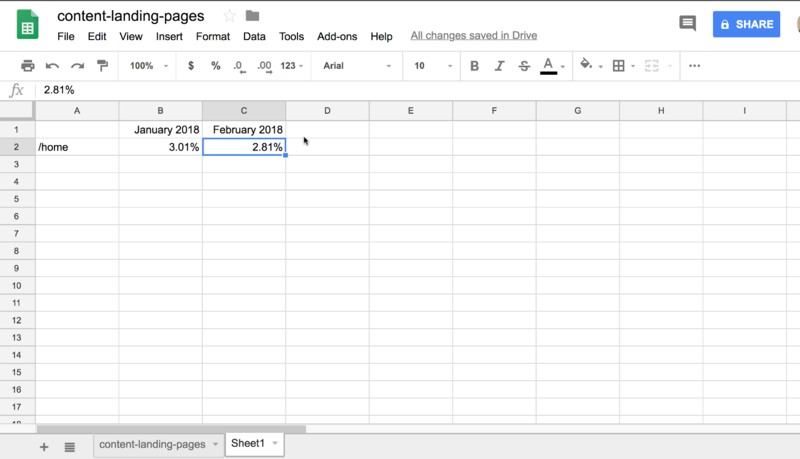 The Google Sheets Add-on is a simple way to access the API. Don’t be a data masochist! Once you’ve identified the report you need, use the API to automate that report. 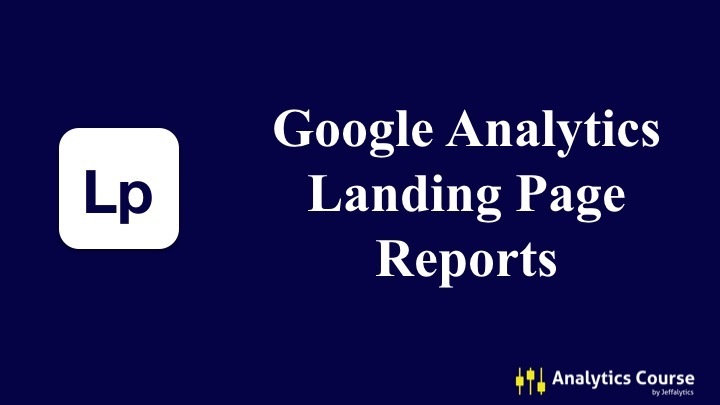 The landing page report is one of my favorite Google Analytics features. Do you want us to expand this tutorial to show you how to automate these reports? Vote with your comments below. If we get enough comments, we’ll add a video about how to automate your landing page reports. This post and video was episode 59 in our 90 Day Challenge digital marketing series. Want to know about each video and post as soon as it comes out? Sign up for 90-day challenge email newsletter. The newsletter will be the best way to make sure you don’t miss any of the content.